No tour of Florence is complete without a visit to this gallery. It houses paintings by Florentine artists spanning the 13th to 16th centuries, but its main draw is Michelangelo's David, carved from a single block of marble when the artist was aged only 29. Originally in the Piazza della Signoria, the colossal statue now stands in an alcove at the end of the main hall on the ground floor. After the visit to these beautiful Florence museums and a 15 minutes of free time for eating a nice Italian gelato, there will be the optional transfer in a Vineyard of Chianti with 1 hour and 30 minutes of free time for lunch (lunch not included) and then the transfer to Siena where You can visit by yourself (no guide) the famous Piazza del Campo and the Duomo. With its rich orange tones and myriads of tiled roofs baking in the strong sun, Siena is a sculpture in its own right. It is a magnificent medieval city surrounded by sun-drenched countryside. 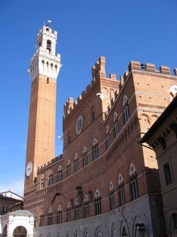 Piazza del Campo is the square where each year is run the famous horse race, the Palio. The Palio is a festivity in which riders representing the town's 17 contrade (neighborhoods) compete on horseback for topo honors. While as regards the Duomo, some consider this Romanesque-Gothic cathedral the most beautiful in Italy. Decorated with contrasting colored marble both inside and out, it was built during the first half of the 13th century in Romanesque and Gothic styles. At this point there is the transfer back to Your accommodation for a break. Then in late afternoon meet, our driver will pick-up You at your accommodation to show Piazza Michelangelo in Florence from where You can admire the sunset. The view from Piazzale Michelangelo makes it worth the effort and should not be missed. After that optional drive to a restaurant with view of Florence and then back to Your accommodation.